3M Sound Page Recorder/Player Unit (model 627AG). The Daniel Langlois Foundation for Art, Science, and Technology, Sonia Landy Sheridan fonds. The Sound Page Recorder was used for education, mostly in Japan. This device recorded on 9 by 12 inch sheets of paper coated on one side with magnetic oxide that captured sound. 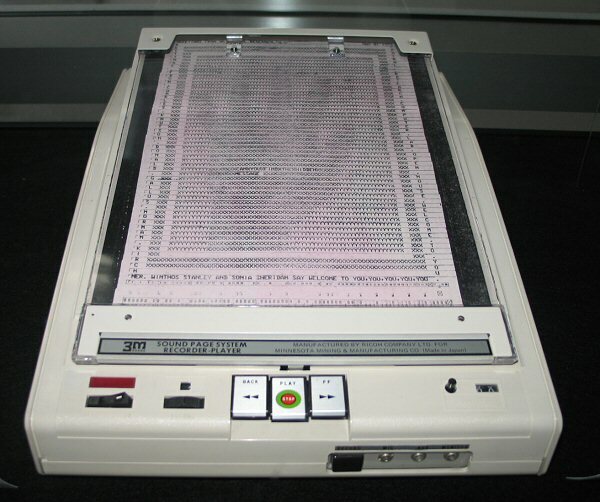 The front of the sheet was blank, making it possible to write text or print an image. On the back of the sheets was a film of magnetic oxide that captured sound, while the front was blank, making it possible to write a text or print an image. In the early 1970s, Sonia Sheridan acquired the Sound Page Recorder used primarily in the education sector (particularly in Japan).